Some encouraging news as pitcher John Smoltz appears to be considering a Congressional run in Georgia. With current Congressman John Linder retiring, the buzz is that Smoltz, a Republican, might run for the seat. Smoltz has helped other GOP campaigns before and he might stand a very good shot. I'd be very pleased to see the former Atlanta Braves ace run for Congress. His legend status in Georgia will serve him well in a race for Congress and would help him in a state-wide race as well. Smoltz hasn't signed with any team as of yet and if he decided to run, he very well might win the seat. The 42-year old would be able to finance his own campaign and have the name recognition to go along with it. Daniel Hannan leads 300 British Tea Partiers. UPDATE - WELCOME INSTAPUNDIT READERS! Please visit the rest of the blog, become a follower, subscribe to our regular articles and visit us often! RELATED: British Paper Slams Obama Dithering on Falklands. The American Revolution was birthed in Boston, Massachusetts, as American Revolutionaries such as Samuel Adams, John Adams and John Hancock fought against the oppressive nature of our British rulers, which included one of the most important acts of civil disobedience in the entire world; the Boston Tea Party. Over 200 years later, citizens of Great Britain are protesting British rule, calling themselves "Tea Partiers" and proclaiming their first event, the "Brighton Tea Party". Did I miss the memo, because I thought America had full ownership to "Tea Parties, Tea Partiers, and the Tea Party", however, it appears our British allies are looking to us for guidance. Led by Daniel Hannan, our American Tea Parties have some friends in Great Britain after all. Thanks to everyone who came to the Brighton Tea Party, and apologies to those who couldn’t get it. We opened and filled an adjoining room, but it was still quite a squash. The hotel manager told me afterwards that there had been more than 300 people present, not counting those who had had to be turned away. Thanks to the Freedom Association for helping to put everything together, and warm thanks to James and Laragh from my office for coming to Brighton to help. Daniel Hannan is a British Patriot, who I wish would become an American citizen and run for Congress in America, however, someone has to stand against oppressive taxation in Britain, perhaps it will result in a British political Revolution. Avitabile-Gruning ticket is full speed ahead. I'd hate to pain hundreds of Conservative individuals across the Nation with boring details from a campaign meeting involving a Village Trustee election, but it involves the Founder and Editor of Jumping in Pools, Matthew Avitabile, who is seeking his second term on the Middleburgh Village Board. There is one problem with the American voter: Village elections, Town elections, County elections and State elections are ignored for Presidential, Senatorial and Congressional elections. When in fact, those local elections will affect your taxes, lives and pocketbooks more than 435 elected Democrats in Congress ever could. Matthew Avitabile and Doctor Gruning understand that. Some might not know this, but Matt is one of four elected Village Trustees in Middleburgh, New York. He does what most Conservative and Republican bloggers don't; he makes a real difference. The meeting this afternoon was interesting and full of discussion, as several individuals, including Matthew Avitabile and Doctor Gruning, prepared for the Village Election that will be held in just 16 days. This is the real America, where ten local individuals join together around a coffee table, with doughnuts and coffee, to work for something on a local electoral basis. I will be writing about the election as March 16th rolls around, and for all in Middleburgh; vote Avitabile-Grunning for the Village of Middleburgh Board of Trustees on March 16th. I believe the Nolan Chart to be one hundred percent wrong, rigged to a particular Libertarian ideological worldview and a disgrace of political ideological tests. Glenn Beck promoted this test on his television show during a special last week, and argued that folks will be surprised to discover their "inner Libertarian". Considering the founder of the Nolan Chart is also one of the co-founders of the Libertarian Party, who would have thought that? I did. Despite answering Conservative each time, the test told me that I am a Libertarian first and foremost. BOGUS! Take the test, and reveal the insane nature of the Nolan Chart. Come on people! Pelosi does not have the votes. Reid will not dare attempt reconciliation. Obama will never join Republicans on one substantial idea. Republicans are fighting to the bitter end. The American electorate will not forget in November. It is impossible for Obama's health care legislation to pass either House of Congress at this point, nothing will change that, and the arrogance of Obama at the "Health Care Summit" will help fuel further Republican and American opposition to the legislation. All 219 Republicans in Washington are opposed to the proposed health care legislation. That meant nothing a few months ago, but Senator Scott Brown is now voting, and Congressman Cao, the lone Republican who supported the legislation in November, is now opposed. It cannot pass. We cannot let the media hysteria affect our dedicated stance for freedom. We are in control, our opponents are losing. Now is not the time to start shivering in fear, because we have the truth and votes on our side. We have dozens of legislative battles upcoming, health care is no longer a legitimate issue for Obama and his minions, the time to prepare for other battles has come. VOTE : Cheney vs. Obama in 2012. VOTE in our included poll! If the 2012 Presidential election came down to a historic vote between President Obama and Vice-President Cheney, who would you support? If the 2012 Presidential election featured President Obama (D) and Vice-President Cheney (R), who would you support? According to sources exclusive to Jumping in Pools, Microsoft will pull off the gaming feat of this generation by releasing its next incarnation of the popular Xbox series. According to our source at Microsoft's facility in Palo Alto, California, the new system will be released on or around December of 2010, just before the Christmas buying season. The new system, which does not have an official name yet, is preliminarily called the Xbox Edge. This new system was originally slated to be released at the end of 2011, but due to the economic slowdown, our source stated, Microsoft thought that it would be best to get a jump on the market. "With people not going out due to the recession," said the source, "Microsoft execs felt that consumers are more likely to stay at home and try out some new technology, especially if it's really ground-breaking." The new system's exact specifications have not been disclosed. However, some general specs have trickled through the source at Microsoft. "The Edge will have at least four CPUs operating at a minimum of 3.8 GHz. That's 3.8 each, not total processing power," the source continued. "This is well beyond anything seen in the market today." The Edge will have four separate 1 GB RAM units, which places its capacity at about eight times the current 360. In addition, the new system will not feature any wired controllers, opting instead for only wireless controllers. According to the source, it is possible that the graphics capability of the system will not be able to be shown on standard definition televisions. Backwards compatibility for the Edge will only be available through Xbox Live, according to the source. In addition, only 360 games will be backwards compatible, and original Xbox games may not be included, according to current plans. The Edge will also not feature memory cards. Due to the acceleration of the release of the Edge, it appears that the games available at launch will be limited. However, it is likely that the next iterations of both Madden and NBA 2K will be available when the Edge is released. The source tentatively that a new Elder Scrolls game will be released in time for the launch. In addition to the new Elder Scrolls game, the source added that plans are in the works for new games. These include a Max Payne game, currently called Max Payne 3: The Death of Max Payne and Call of Duty: Zero Hour. At release, the Edge is believed to have two distinct versions. One basic version, called the Edge Essential will be the rough equivalent to the Arcade. The other version at launch will be the equivalent of the current Elite, dubbed the Edge Prodigy. The Edge Essential will tentatively include: one wireless controller, a 120 GB hard drive, and one month free of Xbox live. The pricing of this unit will most likely be in the $450-$550 range. The Edge Prodigy, according to the source, will be "astounding." The provisional plans for the Prodigy will include one wireless controller, a 240 GB hard drive, a three month subscription to Xbox Live, a DSL cable, a headset system, two different system skins, a demo disc for upcoming releases, and other, newer features. One of them is the inclusion of ten dollars for Microsoft Marketplace. The Prodigy is expected to sell between $600-$700. "Something I'm really excited about is that one out of every fifty new Prodigy systems will include a new Madden 2011 game signed by Tom Brady and Peyton Manning or Avatar signed by James Cameron." Worldwide advertising for the new system is expected to cost Microsoft up to one billion dollars. Deals have already been signed with some of the most visible figures in entertainment. One planned commercial has Tom Brady facing off against Peyton Manning playing Madden against each other. Both shout one of Microsoft's new slogans, "Now that's the Edge!" Another potential commercial has Conan O'Brien unable to tell the difference between reality and the graphics of the Edge. At the end, O'Brien shouts, "No!" as a character in Max Payne 3 is killed. Stephen Colbert is also slated to advertise for the Edge, but as of now, the specifics are unknown. Perhaps the most stunning possibility according to the source, is a remake of the classic Final Fantasy VII. The source stated that the remake is not in stone, but that prognosis is good. "It would be out of this world," he stated. "I know that many fans of the series have been demanding this and programmers I work with, it's a real possibility." The source also cryptically stated that this will be the last "traditional" console that Microsoft will release. He would not go into further detail. This also feeds into rumors that Microsoft will purchase the PlayStation franchise from Sony. Check back for more updates as time goes on. In the last three days I have finished Mass Effect 2, BioShock, and Final Fantasy XII. No doubt there aren't that many high-profile games out there, so days like this may never come again. Here now is my review of the critically acclaimed BioShock. When a flight goes wrong, you find yourself in the middle of the ocean, treading water to survive. Swimming for any sort of land, you find yourself headed to a tower that leads down, down to the underground city of Rapture. Your trip, and the survival that you claw to there, is one of the strongest suits of the game. The setting is very strong; the dystopian, 1930s feeling is there and never leaves. Navigation through Rapture is easy enough, with a certain Atlas directing you with a radio that you find. Much of the narration of the story comes from this simple tool, but it is used very effectively. Of course, Atlas is not the only person you'll talk to, but you can find that out yourself. As for missions, most of the time a helpful arrow a la Crazy Taxi will direct you towards your destination. It works well most of the time, though will occasionally struggle when there are more than one floor to work with. Weapons in BioShock start with your handy wrench and expand from there. By far the strongest part of combat in BioShock are the "plasmids," or genetic mutations, you gain throughout the game. From psychic abilities to strengthening your body, plasmids are a good upgrade system. Unfortunately, throughout the game I couldn't shake the feeling that combat was a little unpolished. Too many times did I have something in my cross-hairs (or circles) where I missed; after playing for more than ten hours, the annoyance adds up. In line with an unpolished feeling was the normally interesting ability to hack turrets, safes, and vending machines. While this is a good feature, in the later stages of the game at times it was literally impossible to hack some systems. Once again, it felt unpolished. 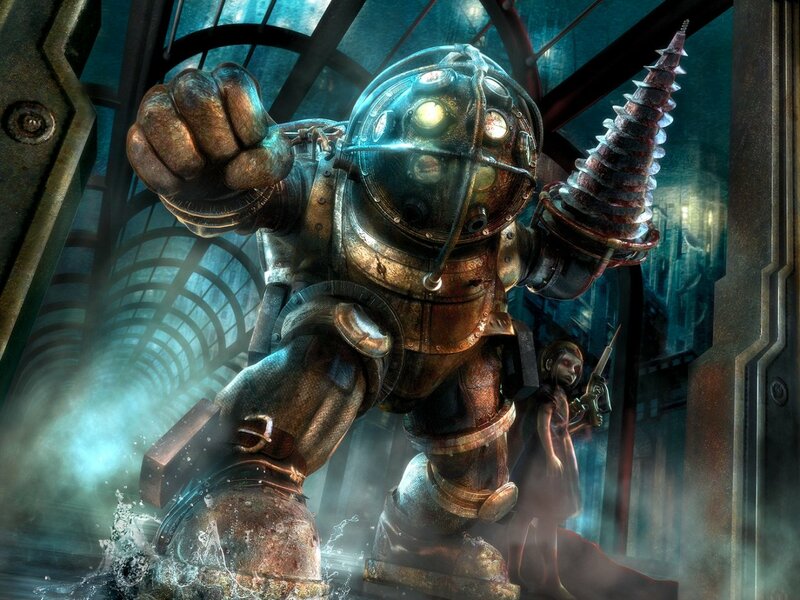 BioShock features one of the best twists in this generation of video games. It takes you by surprise, but definitely makes you wonder how you could miss it. The only problem with it was that it wasn't quite built up enough. However, the very ending of BioShock is not good. It's about a minute and mine (there are three possibilities) didn't really make sense. I was very disappointed by this very subpar ending, and moderately easy final boss fight. BioShock is a good game, but it is not a great game. Without a big payoff in the end, especially after a great twist, leaves the experience dull. The setting is good but the gameplay feels a bit unpolished; pick it up and enjoy it, but don't expect too much out of it. I've interviewed some interesting folks before, however, Pete of www.datechguy.wordpress.com is as interesting as they come. Known for wearing fedoras, eating cannolis and blogging as a Conservative from Massachusetts (of all places), Pete has a lot to write about, and he was gracious enough to accept an Interview offer. This is interview #60 in our series. Pete, what is it like being a Conservative in Massachusetts? It can be daunting because people assume you are liberal. I tend to wear my conservatism on my sleeve so it's not so bad for me. Right now it's actually more interesting since the Brown victory has emboldened conservatives to come out of the closet. Pete, you attended CPAC after raising hundreds of dollars over the Internet, how did you pull that off? I can take very little credit, Robert Stacy McCain started pushing it, and it was picked up by such bloggers as Dan Collins, American Glob and No Sheepies here. They took up my cause and my readers and theirs responded. What astounded me was the fact that of what I raised over 85% was donated by people who never even met me. I'm still in shock over it and my wife still doesn't believe it. I am very conscious of the debt I owe my readers for this and hope my coverage was to their liking. Pete, what was CPAC like? It was like nothing I've ever seen, hundreds of like minded people all excited and engaged in the political process. It gives one hope for the future when we see American Democracy can produce active and interested people who want to make a difference. The one problem I had was there was just SO MUCH to see and do. No one person can do it justice. For any person from a deep blue state it conveys such a feeling of belonging that it astounds you. Pete, who received your vote in the CPAC Straw Poll? Pete, during the Massachusetts Senate election, what was the feel amongst voters? At first the feel was indifference, I was asking people pre-Stacy McCain what they thought about the election and most were simply uninterested, but as the Brown campaign started to take off the feel was one of emancipation. The idea that they were not trapped in a one party system and they could make a difference really took root. The feeling among the Brown supporters was enthusiasm and empowerment. From the Coakley supporters I spoke to the feeling I got was mostly indifference and arrogance. One large exception was a trio of young ladies I talked to on the subway in Boston. If she had more supports like them (all three were from out of state) she might have won. Pete, you covered the Senate race due to RS McCain, what was it like being dragged around the state? It was interesting in the sense that I hate driving in Boston and had to do so much of it, but the actual coverage was great, I was able to share some of my haunts, rub elbows with a lot of people but most interesting of all meet the voters. It taught me that the wisdom of the average voter is something that the political class should cultivate, after all they do the working and the tax paying and the living in the country. Pete, RS McCain comes off as an interesting fella, what say you? Interesting is not a strong enough word. He is a walking energy drink fueled by coffee, cigarettes, beer and the occasional photo with a lovely lady next to him. If you ever saw old movies from the 30's - 50's about reporters, that is him. Tim - Pete, I hear the Tucker Fund is still open, what is the Tucker Fund and how cane average Americans help? Basically I was a computer tech support rep until I lost my job. I've been unable to find work so I used to tease Tucker Carlson who got the 3.1 mil for the Daily Caller that for a mere $800 a week (what I was making) I'd give him 40 hours of work writing. Since Tucker hasn't called, I set up the fund to see if I can make a living doing this. The money goes basically to paying my bills while I keep looking for work. Of course if any conservative (or liberal) publication wants to hire a blogger I'm available for that same $800 per week plus travel and expenses. I'm not much of a drinker and I don't mind eating at McDonalds so guys I travel cheap. Is that a bargain or what! Pete, where do you see the Conservative Blogosphere one year from now? I see it going in two directions. I see it prepping the ground for the 2012 presidential race but I also see it channeling the Tea Parties in the sense that if/when (my money is on when) Republicans take the house back we will be keeping them honest. It's important to remember that we are not electing republicans for the sake of electing republicans, We are doing so because we believe conservatism is the best choice for the country and will allow us to leave a better more prosperous land to our children and grandchildren when we are gone. Power for power's sake is simply corruption. Pete - How many Republicans will be elected in Massachusetts Congressional races next year? My gut says 2 but my head says 1. However both the State and National republican party needs to invest in the boots on the ground to make this happen, we will never get a better chance to make this a two party state on the federal level. We should also be working on local state races, That is far more important than congressional seats since state republicans are the seed corn for national races. 9.0 inches of snow on Wednesday. 10.0 inches of snow on Thursday. 11.0 inches of snow on Friday. 3.0 inches of snow last night. 8.0 inches of snow predicted for today. Before the 33.0 inches of snow that has fallen this week, the area I live in had a combined total of 27.0 inches of snow fall this Winter, which is well below average (despite the rest of the North East is breaking snow records), however, our snowfall amount for the Winter of 2009-2010 has increased to 60.0 inches! Not to mention, but we should be getting eight more inches of snow today, with another storm coming on Wednesday.....I have never shovelled this much snow in my entire life. Consider this an open thread for all residents of Upstate, New York. 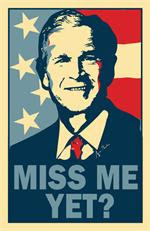 President Bush is still missed. President Bush is making a comeback in the minds and hearts of Patriotic Americans. Some political bloggers will spoil the good memories of President Bush with repetitive articles on what he did wrong, instead of celebrating what he did right. Liberal historians will forever paint President Bush as a thuggish, dictatorial and arrogant leader, but we cannot allow that to stand. President Bush had his downfalls, but he also secured our Supreme Court in excellent hands, defended our Nation against Islamo-Fascists and lead America into an economic period of success. American citizens are not missing President Bush for his unpopular policies, but because he was a commanding leader, who was humble at times, and he wasn't an arrogant Chicago thug. A massive earthquake has struck the South American country of Chile. SANTIAGO, Chile – A massive 8.8-magnitude earthquake struck Chile early Saturday, killing at least 64 people, collapsing buildings and setting off a tsunami. "It has been a devastating earthquake," Interior Minister Edmundo Perez Yoma told reporters. He said at least 64 people have been killed, and "the death toll will continue rising." Bachelet declared a "state of catastrophe" in central Chile. The Bush administration got a lot of things wrong – but at least they usually had some idea of who America’s adversaries were and who America’s friends were. For example, Bush’s policy of maintaining the special relationship with Britain was a simple recognition of the close bonds of alliance, friendship and interests that the British and Americans have had since World War I. In contrast, Obama and his Secretary of State Hillary Clinton are apparently clueless about some of the most basic aspects of foreign policy: supporting one’s friends and fencing in one’s adversaries. The declaration of neutrality on the issue of the sovereignty of the Falklands issued by the US State Department is clear proof of the uselessness of the Obama administration. In the grand scheme of things it makes little sense for America to give moral support to the Kirchner government in Argentina. Kirchner is no friend of the US and Kirchner’s government is in deep domestic trouble for its gross mismanagement of the economy and its attempts to suppress the press criticism of the regime at home. One has to wonder what benefit America gets out of hurting Britain on this issue. Perhaps Obama thinks that the more Leftist Latin American regimes will somehow approve of the US. If that is the case, he is truly mistaken, as most Latin American nations dislike the Argentineans, and have little sympathy for the mess Argentina got into over the Falklands. But this mess is just typical of the drift in US foreign policy – if one can say that it even HAS a coherent foreign policy these days. As I said, at the core of the problem is a simple inability to recognise and support our friends over adversaries. In his first year in office Obama made numerous apologies for America’s past to the Third World, he effusively greeted the Venezuelan dictator Hugo Chavez, he bowed low to the Saudi ruler, and called for a “reset” of relations with Russia – all the while implying that America was at fault for all these problems. At the same time he rudely undermined the security of America’s Eastern European allies by cancelling the ballistic missile defence with no notice and no prior discussion, he failed to push for a free trade agreement with Colombia – America’s strongest ally in South America – and he supported Chavez’s allies when they tried (luckily unsuccessfully) to unseat a democratic and pro-US government in Honduras. A big part of the problem is a Secretary of State who is a lightweight as far as foreign policy is concerned. Obama brought Hillary Clinton into the cabinet for domestic policy considerations. He needed to put Mrs Clinton – and her husband – under tight control. As a powerful senator from New York, she would probably have taken over as the de facto leader of the Democratic Party and been able to challenge Obama’s “Chicago Gang” for control of the party. Despite the acclaim that America’s mainstream media has heaped on Hillary Clinton over the years, her foreign policy background and experience before becoming Secretary of State was to accompany her husband on foreign trips and preside over “first wives” dinners for the spouses of visiting heads of state. One learns a lot about protocol and ceremonies – but this is no preparation for the real work of making policy. Clinton has no experience or education in foreign policy. She speaks no foreign languages and has never lived abroad. She lacks the intellectual temperament to be a foreign policy leader. Like Obama, she has long surrounded herself with sycophants. On assuming office, Obama’s vision of foreign policy was simple: he would repudiate past American policies and the whole world would melt before the president’s charm. The administration somehow thought that we really didn’t have enemies with agendas completely hostile to our own – there were just countries that had become offended by US actions and they would happily cooperate with America as soon as the evil Republicans were gone. Well, it hasn’t worked – and there was no Plan B. With a president overwhelmed by domestic problems, Hillary Clinton has failed to step in and set a foreign policy vision. Simply put, she does not have the brains or the experience to develop a coherent foreign policy vision for America. This is how we get policy mistakes on issues such as the sovereignty of the Falklands. The Daily Telegraph, one of the largest newspapers in Great Britain has written an op-ed slamming the Obama Administration's handling of the Falkland Islands issue. This comes after Obama snubbed British Prime Minister Gordon Brown last year and also released documents accusing Britain of cooperating in torture. The Telegraph couldn't be clearer in decrying Obama's cluelessness on foreign policy, especially about the Falklands. Recently as much as 40 billion barrels of oil was found surrounding the islands, which are owned by Britain. Argentina's claims and invasion of the islands in 1982 led to a short war which Britain decisively won. One has to wonder what benefit America gets out of hurting Britain on this issue. Perhaps Obama thinks that the more Leftist Latin American regimes will somehow approve of the US. If that is the case, he is truly mistaken, as most Latin American nations dislike the Argentineans, and have little sympathy for the mess Argentina got into over the Falklands. BREAKING- A large 7+ earthquake has struck off the coast of Japan. More news as it unfolds. UPDATE- A tsunami warning has been issued for several islands. BREAKING- Governor David Paterson has just dropped out of the NY governor's race. Paterson defiantly says that he has never done anything unethical, and that he is looking forward to the rest of his term in office. 10 Republicans that need to go. The United States House of Representatives passed a twelve month extension of the USA Patriot Act last night, that will result in three crucial provisions of the important National Defense legislation remaining intact. The final vote was 315-97, as just 65% of congressional Democrats supported the extension of USA Patriot Act provisions. On the flip side, over 93% of congressional Republicans supported the crucial legislation last night, with 10 Republicans voting in opposition. I believe those ten Republicans should be targeted in congressional Primaries across the Nation, because these are positions we cannot and should not tolerate. I can deal with some liberal positions on economic, abortion and Constitutional policies, but Conservative Republicans should never accept liberalism on National Defense. We need to support strong National Defense oriented Conservative Republicans, who believe in defending our homeland. I am ashamed of the political endorsement that Congressman Johnson received from me a few weeks ago, and I call on a strong Conservative to challenge him during the 2012 Republican Primaries. National Defense cannot be "moderated", we must teach the above mentioned Republican traitors a stern lesson. Following revelations that he covered up domestic abuse, Governor David Paterson of New York will no longer seek election in the NY gubernatorial race this year. The embattled Governor has seen a tremendously low approval ratings in the last few months, but decided to launch his campaign to stay in office last week. Among calls for him to stop, just yesterday the Gov. said that he would not step aside. Today, however, the tables have turned. Paterson's flip on his campaign leaves the door wide open for Andrew Cuomo, the Democratic front-runner who still has not officially declared his candidacy. At 3 o'clock this afternoon the Governor will hold a press conference, where it is expected that he will announce his withdrawal from the race. Whether or not this will lead to Paterson's outright resignation is still unclear. For those who are frequent listeners of 810 WGY in Upstate, New York or appreciate dedicated fans attempting to restore local broadcasters onto the airwaves, the fans of Al Roney will provide inspiration and drama in the coming weeks. Before discussing the dedicated efforts of Roney fans, we should understand the background of this interesting local headline. This whole process started a few weeks ago, when 590 WROW dropped its entire news format, which included Dennis Miller, Glenn Beck, Alan Colmes and a slew of local talk show hosts. This left the entire Capital Region of New York (a big Conservative talk show market) without one station broadcasting the Glenn Beck Program, which opened a successful door for 810 WGY to include the popular, high ratings, national talk show host, instead of a popular local talk show host. 810 WGY had a tough decision to make, but in the end, Glenn Beck will provide higher ratings, which is the name of the game. After the news was announced this morning that Beck will be replacing Roney on the airwaves for three hours per morning, the fans revolted. WGY announced that it was replacing host Al Roney’s program with Glenn Beck’s syndicated program just hours ago. But already there’s a Facebook page established to get Roney back on the air. And that page, which is here, already has 31 72 221 301 fans. “Show GY you want local coverage,” the page says. A few hours later.......dedicated fans have escalated their "Pro-Roney" efforts. Supporters of fired talk show host Al Roney say they will rally Monday outside of radio station WGY (810 AM). The station, owned by Clear Channel Communications, fired Roney on Thursday, announcing it would replace his show with a syndicated program hosted by Fox News personality Glenn Beck. The station, noting Beck’s popularity, says it made the move for ratings reasons. But Roney supporters are bemoaning the loss of a local voice on the Capital Region airwaves. Monday’s rally is scheduled for Monday from 9 a.m. to noon — the hours during which Roney’s show aired. WGY is located at 1203 Troy-Schenectady Road in Latham. The rally, if held, will be the second radio station protest in recent weeks, as listeners of WROW (590 AM) gathered earlier this month outside that station to protest its cancellation of talk radio. It was WROW’s move, in fact, that made Beck’s program available to WGY. It appears that fans of the former host are overreacting, as the station had to make a choice based on what was best for the business instead of what a few fans wanted, but Jumping in Pools will be covering the news over the next few weeks and we applaud the dedicated efforts that Roney fans have displayed. I joined Twitter a few months ago, and I see no real reason to write 140 character messages on a regular basis to hundreds (15 for me) of unknown people around the world, except for spreading the word about your blog or website. Perhaps it's just me, but spending several hours "tweeting" is an insane past time. Unless, you're R.S. McCain, which means Twitter is your political blog lifeline. I prefer sending dozens of emails to Conservative bloggers, posting on Blogs Lucianne Loves or sending links to Insta Pundit or Elizabeth Benjamin (New York Political Guru). However, McCain has now admitted to Twitters Addiction. Back to the unknown, somewhat-main point of this idiotic article: Tweeting is a useless and idiotic past time, unless you're R.S. McCain or you're spamming your political blog through "tweets". OK.....to be honest, I just wrote this article to receive some "linking love" from McCain's blog and to encourage all readers of Jumping in Pools, insane or otherwise, to follow me on Twitter, because "15 followers" is embarrassing. Following weeks of wild speculation, the public believed that the New York Times had released a sub-par, over-hyped story concerning NY Governor David Paterson. Now, a week after the article was released, the actual story has been published. And it is big. Governor Paterson and State Police intervened in a case of domestic abuse that was out of their jurisdiction. Not only that, but they harassed the woman involved to drop the charges. These revelations come at a time when the governor's approval rating is exceedingly low and his gubernatorial campaign is running on fumes, even before it has really started. There is new speculation that this story is so bad that Paterson will resign, following Deputy Secretary for Public Safety and Commissioner of the Division of Criminal Justice Services Denise O'Donnell's lead. From what I have seen from the defiant Gov. in the last few months, I believe that he will not resign over these revelations unless more is revealed. Paterson has pushed against fellow Dems by running for governor and has thumbed his nose at NYers by pushing a sugar tax. These things tell me that he will try to stay put. And yet, there are calls for his resignation. Women's rights groups have called for him to step down, and many say that Paterson is on a political death watch. Whether or not Paterson steps down, he is a lame duck. Though we normally focus on national politics, I feel compelled to write a piece on this. Al Roney, who has held the 9am-12pm slot at WGY for years, is getting replaced by Glenn Beck. The news has been sudden, and conflicting commercials on WGY say that Beck is starting either today or Monday. Now, I don't know why Roney is being fired all of a sudden. Maybe his ratings were poor, maybe GY wants to go in another direction, maybe Mr. Roney did something bad. I do not know. However, something I do know is that I have been listening to Al Roney's show for years and I have never been disappointed. Not only was it a good show, it was by far the best local radio show. I do remember that Glenn Beck was in the 9am-11:35am slot before Al Roney (at 11:35 they put on Paul Harvey for twenty minutes). It could be that WGY misses the days of Beck. If this goes through, and it appears it will, maybe Mr. Roney could get a later timeslot. So, from all of us here at Jumping in Pools, we'll miss you Al. Castle holds a 21% lead in Delaware. Health Care legislation is dead. The unapologetic Conservative believes in? 2.0. Could a former Jet defeat a corrupt legislator? Heartless Liberals attack ill Cheney. Obama just doesn't get it. The Utah Model for the Federal Government? Is Israel closer to striking Iran? 2010 CPAC Presidential Straw Poll results are in. Estimated cost of attending CPAC 2011. Which Glenn Beck will we see tonight? UPDATE: Austin Plane Crash Intentional Terrorism? Hayworth is playing liberal politics. Daily Kos : Tea Party is good news for Reid. Responding to "Is Sarah Palin a dunce" response. Next black United States Senator? Will Hoeven win in North Dakota? CPAC credentials for me? NOPE. 35% of Americans are idiotic wingnuts. New York Senator to hang with truther?